Supergirl was a joke. Until about 15 years ago she was memorable mainly for her campy ‘80s movie and that time she died in that comics, possibly because her campy ‘80s movie was so bad. Yet as the Supergirl series continues to be popular on the CW, the DC movieverse’s Superman is in limbo, and a new Supergirl film is beginning to take shape, it seems like Warner Bros. is finally picking up on the fact that Supergirl, not Superman, best embodies the 80-plus years of Super mythos. The Super mythos is pretty succinct at its core – a refugee comes to Earth from another planet, integrates, falls in love (with the planet and the people), and becomes Earth’s most stalwart citizen. For decades, the premiere Super has been Superman. The fable of a child cast away to avoid destruction and growing up to defend his adopted homeland was fine Americana and usually resulted in some great yarns. I’ve said it before, but it bears repeating – the best Superman stories are the ones that acknowledge and expand upon his experience as an immigrant. The U.S. is a country made of immigrants (political attempts at historical revisionism aside), and one of the reasons Superman has frequently felt like such an American character is because he has that experience. Like Superman, many of us wrestle with reconciling two upbringings. We struggle with long legacies of families who seem frankly alien to our own experiences. Superman realizes his heritage is both a family of farmers in Kansas and an alien language he cannot speak with a culture he cannot understand. That resonates with people! Yet Superman’s experience as an immigrant who falls in love with an adopted homeland and chooses to protect it (often from all those Kryptonians who are supposed to have died and clearly did not) is a different one from the immigrant experience most of my friends and family know. They come here not as babies, but as children and adults who must assimilate. And for them, Supergirl might be a more appealing figure – particularly after Jeph Loeb and Michael Turner radically transformed the DC Comics character in 2004. From 1959 to 1986, Kara Zor-El was Superman’s cousin who was raised on a barely surviving piece of Krypton flung away during its destruction. Owing to the nature of storytelling at DC, pre-1986 Kara was a fickle figure with no consistent characterization and a deeply convoluted history. That didn’t improve after she was killed off in the 1986 Crisis on Infinite Earths storyline, because DC then tried to create a new character capitalising on the surprisingly large fandom that still found her appealing. First came Matrix, who was legitimately a pile of sentient goo that would have definitely bonded with Deep Space Nine’s Odo. Then, when that didn’t work out (she was in love with a hairy Lex Luthor from an alternate universe) she merged with a human woman, became an angel, and moved to a pre-Crisis Earth to have a kid with Superman (gross) and try to save a pre-Crisis Kara. Matrix failed and essentially fled the universe because she was sad that her child with Superman (again, gross!) was probably killed in the Crisis. In 2004, partially due to the popularity of the Supergirl character introduced in Superman: The Animated Series – whose origin borrowed heavily from the pre-Crisis era – she was rebooted again, this time in Jeph Loeb and Michael Turner’s Superman/Batman series. Once again she was Superman’s cousin, but this time she was immediately allowed a degree of pathos denied her predecessors. Because this Supergirl wasn’t raised on a post-Krypton piece of Krypton, she was a survivor of the destruction, sent by her parents to raise her cousin Kal-El. Supergirl was suddenly allowed to remember what had been lost and was also immediately stuck with the failure to protect Kal-El after arriving on Earth long after he did. The Supergirl book that followed was brief and had some...not good art, but Supergirl felt like an actual character to root for and not just the girl clone of DC’s cash cow. She struggled with making friends and dealing with people who hated her for not being from the same place they were. She also had a big history that she found frustrating to try to impart to her well-meaning cousin. 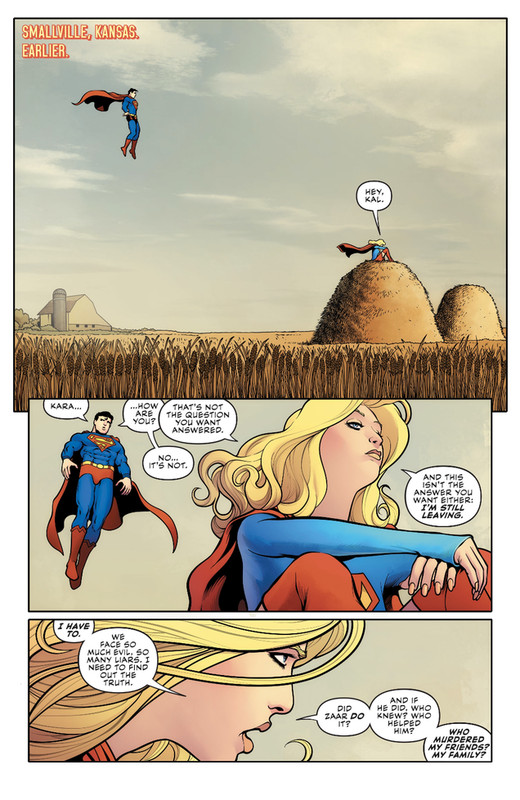 Many of the beats of that story, as well as that character’s pathos and more consistent characterization, have carried over into the Supergirl stories since – from the TV series to the fantastic Injustice 2 to the comics both monthly and one-off (including her latest story that kicked off this month). Where once Supergirl was a hodgepodge, now she is a constant with an origin that can endure multiple retellings and somehow always stay the same in the best of ways. This new story feels more in line with the world we’re living in right now, where immigrants are demonized and where women find themselves stuck trying to claw out of the shadows of men who maybe, sometimes, don’t know as much. DC and Warner Brothers repeatedly struggle to reboot Superman. They’re on film franchise attempt number four, with at least five other failed attempts in the last 30 years, and Brian Michael Bendis has been so flummoxed by the character in comics he decided to send his family – including Supergirl – off to parts unknown to try and understand him. Supergirl, meanwhile, has actually been pretty successful! Apart from that one film in the ‘80s, she’s been central to the CW’s Arrowverse and the Injustice-universe and is primed to take the DCEU by storm. It only feels right that she gradually take her cousin’s place in DC’s Trinity. Maybe not officially in comics – but at least in the public’s eye, and in movies and TV too. Superman’s cousin from Argos is finally supplanting him as the Super that matters, and that’s wonderful.